These miniature wall covering have a top border. Several also have a bottom border. Papers are measure 12" floor to ceiling. Trim to right height. 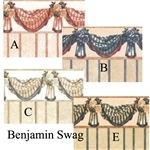 We have a variety of style to fit your miniature dollhouse scene. Brodnax designs are printed on a sightly heavier paper than MiniGraphics. Wall paper paste is recommended for installation. The wall papers are approx. 18" wide and 12" in high. 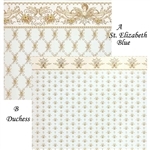 The price shown is for 1 sheet of wallpaper unless otherwise stated. 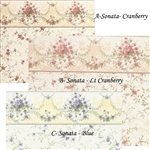 Picket Fence has a top border and a lower flower garden. Harvest by Brodnax Prints has top border with stripe paper..
Cookie Jar by Brodnax Prints makes a wonder kitchen paper. Sam's Corner MiniGraphics Paper has a brownstone row house border. Ambrosia MiniGraphics Paper has vivid fruit border with fruit stripes. 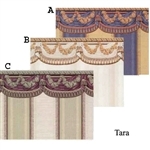 Spring Pallette has a top floral border and a lower trim to flower pots. 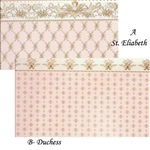 Brodnax Prints St Elizabeth with large border and Duchess with small border. They complement each other. Patina in stripe pattern of copper and bronze. Brodnax Prints wall paper measures approx 18" x 11.5" high. St George in blue pattern with border. Brodnax Prints wall paper measures approx 18" x 11.5" high.